Description: A high hood SD40-2 visits Conrail Shared Assets Oak Island yard. Description: Y205 and it's usual run-around on the Wye and pushes it's cars back to North Yard. Description: CSX GP15-1 takes a turn today for powering D716. Description: D716 pulls out of the yard as Y205 in the background waits for clearance on the Toledo Wye. Description: Y205 pushing across the diamond to East Yard. Description: In the last mintues of dailylight: we see Y205 finishing it's work in East Yard. Description: Approaching the diamond on their way south through North Yard, passsing the standing CSXT 1547 and CSXT 8570. Description: CSX power in the yard at Decatur, Illinois. Description: A GP15-1, the fourth engine on a westbound freight manifest train in the Cumberland Freight terminal. 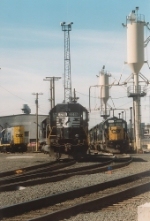 It is a former Conrail 1641 built November 1979.